Photo courtesy of Self-Realization Fellowship, Los Angeles, Calif.
LOS ANGELES, September 18, 2017—January 5, 2018 marks the 125th birth anniversary of one of the pioneering fathers of Yoga in the West, Paramahansa Yogananda, author of the modern spiritual classic Autobiography of a Yogi, and subject of the highly acclaimed documentary AWAKE: The Life of Yogananda (2014). Sri Yogananda’s best-selling spiritual classic, Autobiography of a Yogi, which has introduced millions of readers to the philosophy and practice of yoga meditation, and has been translated into 50 languages, remains one of the most important, and most readable, works on Yoga and Eastern spiritual thought, having “prompted more Americans to explore Indian spirituality than any other text,” according to Philip Goldberg, author of American Veda. His highly acclaimed interpretations of the Bhagavad Gita (God Talks With Arjuna), the four Gospels (The Second Coming of Christ: The Resurrection of the Christ Within You), and the Rubaiyat of Omar Khayyam (Wine of the Mystic: A Spiritual Interpretation), provide groundbreaking insight into the underlying unity of the religious beliefs of East and West. 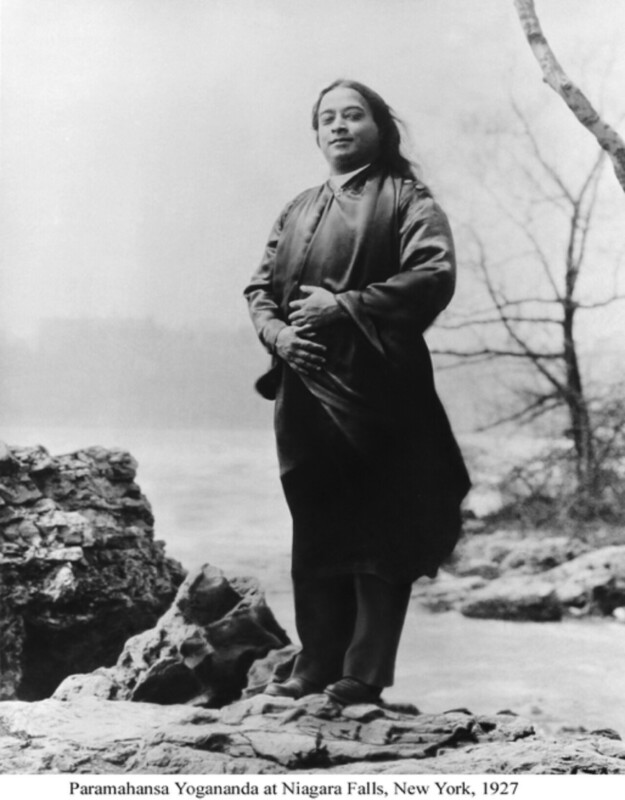 Paramahansa Yogananda first arrived in America from India in 1920, to serve as a delegate to an International Congress of Religious Liberals convening in Boston. That same year he founded Self-Realization Fellowship (SRF) to disseminate his teachings on India's ancient philosophy of Yoga and the science of meditation. He began his life’s work with the founding in 1917 of a boys’ school in Ranchi, India, which later became Yogoda Satsanga Society of India (YSS). In 1925, Sri Yogananda took up residence in Los Angeles where he established an international headquarters for his organization. Over the next decade, he traveled and lectured extensively, speaking to capacity audiences in major cities throughout North America and Europe. To the tens of thousands of Westerners who attended his lectures, his discourses on the unity of “the original teachings of Jesus Christ and the original Yoga taught by Bhagavan Krishna” were a revelation. Growing public acclaim prompted President Calvin Coolidge to invite Sri Yogananda for a personal meeting at the White House in January 1927, making him the first Swami to meet with a U.S. President. Many prominent figures in science, business, and the arts became his students, including horticulturist Luther Burbank, operatic soprano Amelita Galli-Curci, George Eastman (inventor of the Kodak camera), poet Edwin Markham, and symphony conductor Leopold Stokowski. Later Beatle George Harrison, folk singer Judy Collins and pop superstar Madonna each publicly acknowledged Sri Yogananda’s influence on their lives. Late Apple founder Steve Jobs brought attention to Autobiography of a Yogi posthumously in 2011 when he arranged for copies of the book to be given to attendees at his memorial service. Paramahansa Yogananda was born Mukunda Lal Ghosh on January 5, 1893, in Gorakhpur, India, into a prosperous and devout Bengali family. From his earliest years it was evident to those around him that his awareness and experience of the spiritual was far beyond the ordinary. As a youth he sought out many of India's saints and philosophers, hoping to find an illumined teacher to guide him in his spiritual quest. In 1910, at the age of 17, he met the revered Indian sage Swami Sri Yukteswar, in whose hermitage he spent the better part of the next ten years. After graduating from Calcutta University in 1915, he became a monk of India's venerable monastic Swami Order, at which time he received the name Yogananda (signifying bliss, ananda, through divine union, yoga). Mahatma Gandhi and Paramahansa Yogananda met a decade afterwards when the latter made a return visit to India in 1935–36. At the Mahatma's request, Yogananda instructed him and several of his followers in the spiritual science of Kriya Yoga. During the 1930s, Sri Yogananda began to withdraw somewhat from extensive public lecturing in order to devote himself more to his writings, to establishing Self-Realization Fellowship temples and meditation centers, and to building a firm foundation for the future of his spiritual and humanitarian work. Under his direction, the personal guidance and instruction that he had given to students of his classes was arranged into a comprehensive series of SRF Lessons for home study. Paramahansa Yogananda passed away on March 7, 1952, in Los Angeles, following his delivery of a speech at a banquet honoring Dr. Binay R. Sen, India's Ambassador to the United States. His passing received widespread coverage in the press, including in The New York Times, The Los Angeles Times, and Time magazine. In 1977, on the occasion of the twenty-fifth anniversary of Paramahansa Yogananda's passing, the Government of India formally recognized his outstanding contributions to the spiritual upliftment of humanity, by issuing a commemorative stamp in his honor.